Note: If you are the parent or guardian of an ICC Student – your student must first authorize you as a user before you can make a payment to their account. Information and instructions on Authorized Users is available here. We’ll begin by logging in to your ICC eServices Account at my.icc.edu. You will need to know your ICC eServices username and password. If you need assistance, contact the ICC Technology HELP Desk at (309)694-5457. 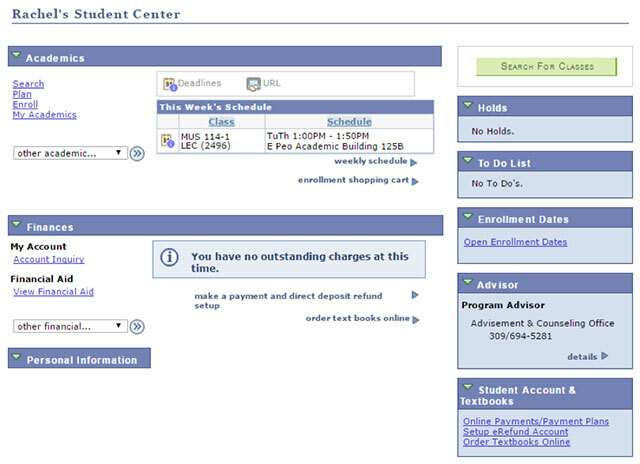 This is the Student Center page of your ICC eServices Account. 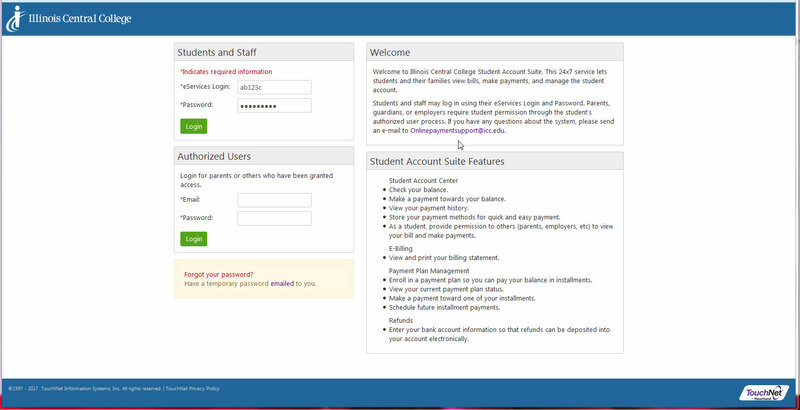 From this screen you can Enroll, View your Class Schedule, Check your Financial Aid, View any Outstanding Balances, and more. In the middle of the page, you’ll find an Account Summary with any outstanding balances you may have. 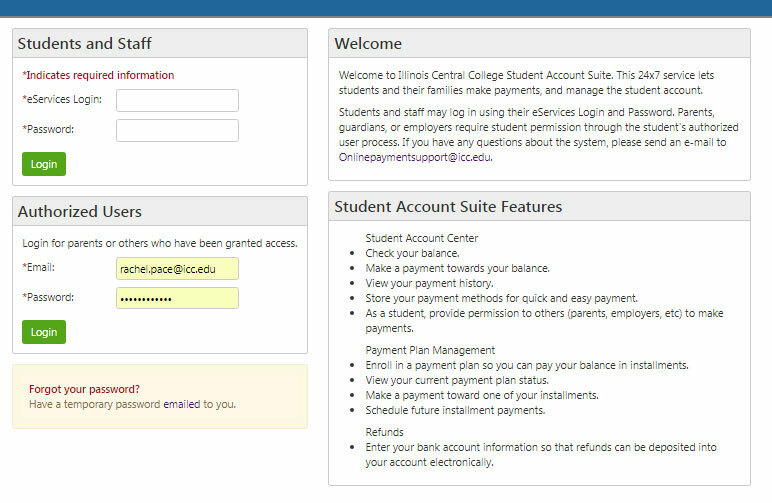 To access the ICC Secure Payment Site, click the Online Payments/Payment Plans link from the Student Account & Textbooks box on the right side of the screen. This will take you to the secondary log-in screen for the ICC Secure Paysite. ICC Students can use their ICC eServices username and password to access the secure site in the Students and Staff section.Authorized parents or guardians can log-in using the Authorized Users section. Once you’re logged into the secure payment site, you’ll find a number of options and information including your current Account Balances for classes at ICC. 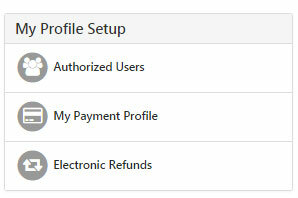 To begin, click the Authorized Users button on the right of the page (under My Profile Setup). From this page you can give others (parents, guardians, employers, etc) the ability to access your account information. In compliance with the Family Educational Rights and Privacy Act of 1974 (FERPA) your student financial records cannot be shared with a third party without your written consent. Adding an authorized user is your written consent that an individual may view your account information and make payments on your behalf. Note that authorized users DO NOT have access to your stored payment methods, academic records, or other personal information. Authorized users can only view their own payment methods and account information. Enter the authorized user’s email address, choose whether you want the user to view your payment history & account activity, and click the Continue button. Review the agreement and click I Agree to authorize the user to have access to your account. Your authorized user will receive an email at the address you provided with instructions for logging in and viewing billing information. To begin, check your email for the Authorized User Email sent to the address your student submitted when authorizing you access to their account. The email will contain the student’s name as well as your Authorized Username, Password, and a Link to the Secure Site login. Click on the link to go to the Secure Payment Site.